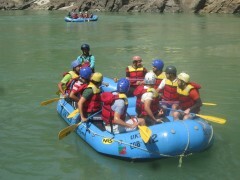 This rafting trip in Rishikesh takes you from Marine Drive to Laxmajhula. You'll spend one hour battling the rapids of the Ganges, and will encounter rapids like Black Money, Cross Fire, Three Blind Mice, Double Trouble, Club House, and the Terminator on this 26 kms stretch. At the end, you'll paddle into calmer waters, and will try a bit of body surfing and cliff jumping. 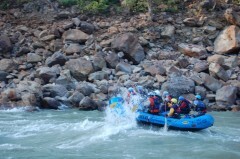 This rafting trip is ideal for those looking for an adventurous rafting trip on the Ganges. 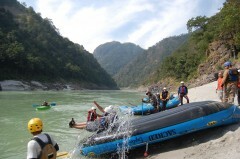 • Battle Grade III and IV rapids on a 26 kms stretch from Marine Drive to Laxmanjhula. • Encounter rapids like Three Blind Mice, Return to Sender, Golf Course, Double Trouble, Terminator and Club House. Arrive at the operator's site office at 08:30 hours and you can offload your luggage here. 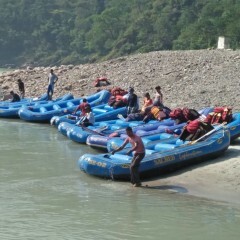 You'll be driven to Marine Drive, the start point for the 26 kms rafting in Rishikesh and you'll be briefed about the security measures and rescue techniques. After this, you'll begin your thrilling rafting trip. 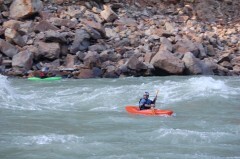 Encounter the best rapids on the Ganges, like Double Trouble, Three Blind Mice, Roller Coaster, Return to Sender, Golf Course, Black Money and Cross Fire along the scenic stretch. On the calmer stretches, you'll also try your hand at body surfing and cliff jumping in the river. 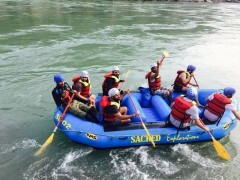 Your rafting session culminates at Laxmanjhula and your trip ends here.